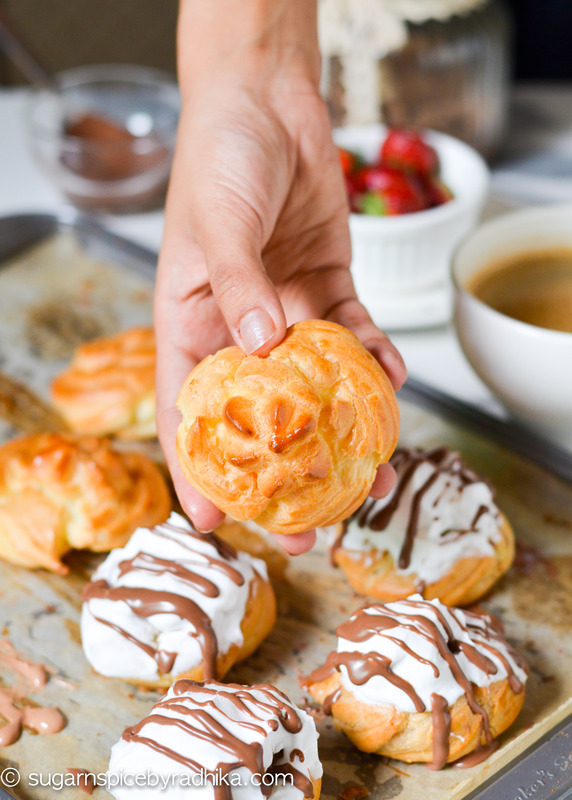 Make soft and pillowy delicious Cream Puffs stuffed with a creamy Nutella filling and topped with more Nutella! My first attempt at making choux was an absolute success, the eclairs I made turned out so good so I thought I’d continue my lucky streak with choux and make some Nutella Cream Puffs too! These cream puffs are nothing but a mini and a more compact version of my eclairs. 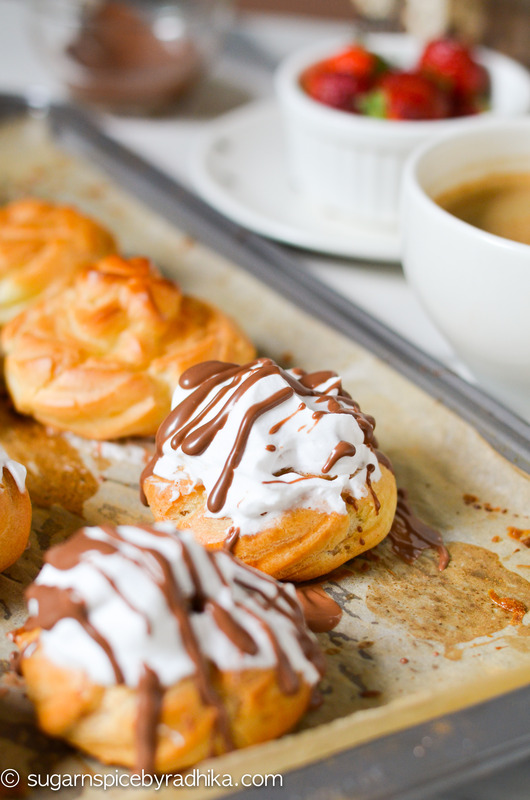 These mini puffs are so handy and serve as great tea time desserts. Who wouldn’t like these mini puffs on their high tea platter? I know I would! If you haven’t read my The Easiest Eclair Recipe blog post and aren’t really familiar with choux, then let me quickly explain what it is. Choux is a French pastry that’s made with flour, sugar, butter, water, and eggs. Vanilla is added to mask some of that eggy flavour and a teeny bit of salt to balance out everything. On its own, choux pastry is an almost tasteless, it has big air pockets and is almost (but not completely) bread-like. It has a nice and crunchy outer crust and a soft inside. 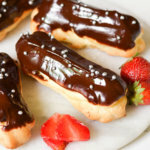 Ideally, choux pastry of any kind eclairs, cream puffs, profiteroles are filled in the centre with some sort of filling. 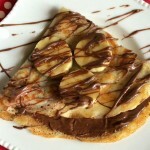 My choice of filling today is a creamy Nutella filling, because lets face it, who can say no to Nutella! 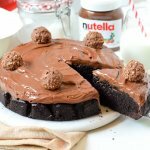 If you want any of your recipes to go down well with everyone, I say put Nutella in it! 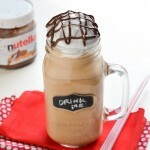 The rich chocolaty and nutty flavours from Nutella are dependably a hit. 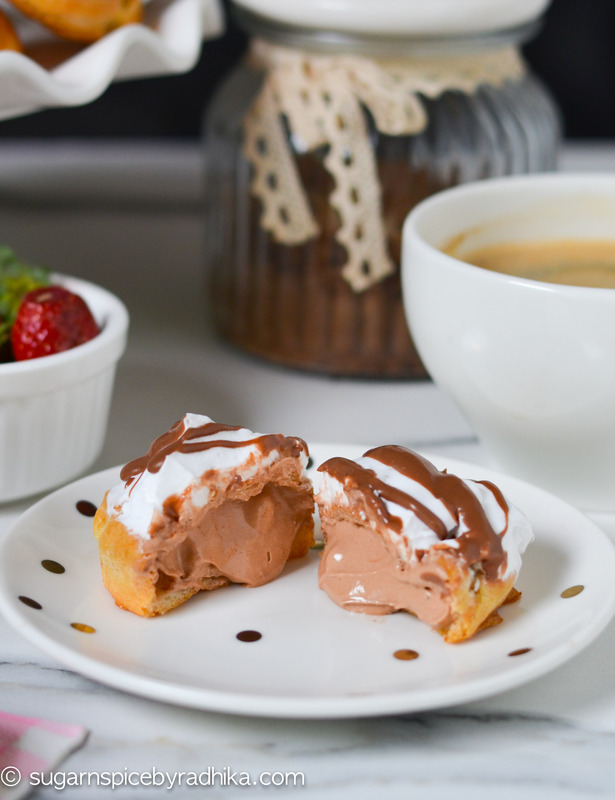 Try these Nutella cream puffs for your next high tea—I promise your guests will be left in awe! 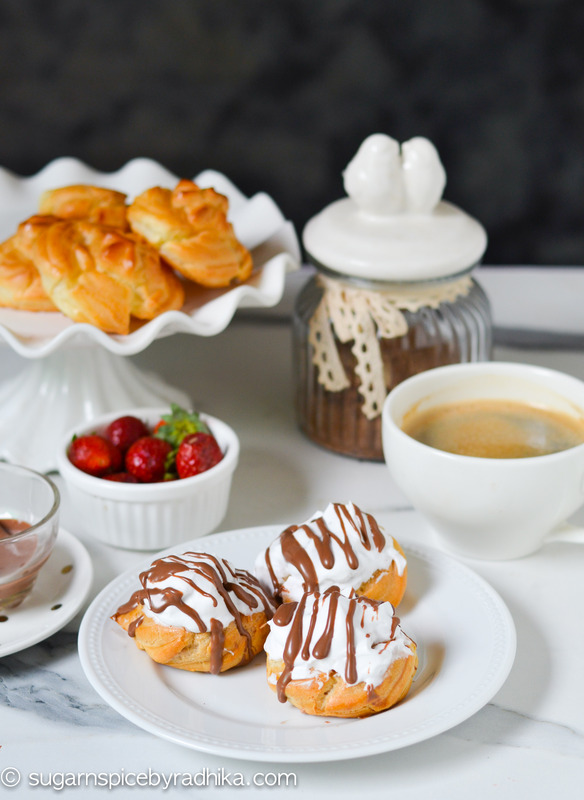 Cream puffs are made the same way as eclairs. Start by boiling the water, butter, salt and sugar in a large saucepan. Once the ingredients come to a boil, remove the saucepan off the heat and pour the flour in one go. Mix continuously until a dough is formed. Transfer this dough into a bowl and let it cool down. Once cool, start adding the eggs one by one and mix them in. Once all the eggs are in, add in the vanilla extract. The mixture will be of a good dropping consistency now, so transfer it into a piping bag with your favourite nozzle on. Before piping prepare a cookie tray by brushing it with butter and lining it with parchment paper. Start piping about 2 inch wide rosettes circles on the parchment. If you think the pastry is too thin, double layer it. Once done, put the tray into the refrigerator to set for about 15 minutes. Next, brush the pastries with some egg wash on top and bake them in a preheated oven for 12-15 minutes at 180 degrees celsius. 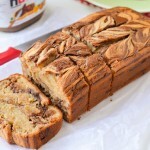 For the Nutella cream: Whip cream until stiff peaks form. 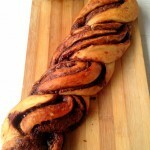 Once whipped, add in the Nutella and whisk that in too. Transfer this to a piping bag and refrigerate. In another bowl, whip some more cream (listed under "top") until stiff peaks form and refrigerate this too. Once the puffs have cooled down, using a knife or something sharp, make a hole at the bottom. 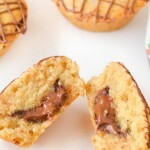 Fill the puff with Nutella cream through this holes. 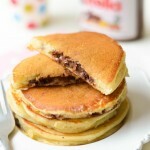 Next, dip them in the plain whipped cream and drizzle with melted Nutella.